On Tuesday May 08, forty-seven (47) families (including members of the protective service and defence force) received keys for their new homes located at Real Spring, Valsayn South. This HDC community spans 22 acres and is expected to provide a total of 408 units, once fully completed. In his Feature Address, Dr. the Honourable Keith Rowley, Prime Minister and Minister of Housing and Urban Development, summarised the history of this project which began in 2005 but was subsequently stalled. The Honourable Prime Minister, also took the opportunity to provide an update on the 19 active housing projects at 15 locations across Trinidad and the plans for 40 additional projects which are on the horizon. 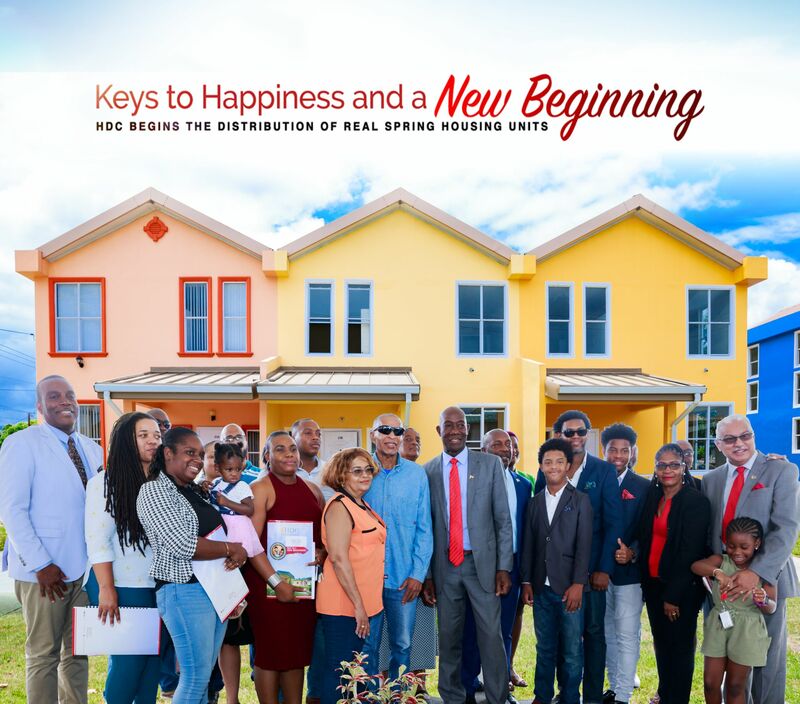 Prime Minister Dr. Rowley, also acknowledged that while the Government is unable to provide subsidized housing for all of the applicants on the public housing database, the state will continue to play a major role in the housing sector as there are several economic and social benefits to the provision of these affordable housing solutions. Also providing remarks was HDC Chairman, Newman George who updated attendees on some of the developments which were previously stalled but re-commenced over the last two years. The Chairman also reminded the new home owners to honour their monthly financial commitment to the HDC. Also witnessing the Housing Distribution Ceremony were: the Honourable Terrence Deyalsingh, MP for St. Joseph; Esmond Forde, MP for Tunapuna; Paul Leacock, Chairman, Tunapuna/Piarco Regional Corporation; Simone Thorne-Mora, Permanent Secretary, Ministry of Housing and Urban Development; Brent Lyons, Managing Director, HDC and members of the Joint Protective Services Housing Committee. Congratulations and best wishes to all new home owners!